My Toy (The Zionist series) by Mário Macilau (b. Maputo, Mozambique, 1984) forms part of the Pangaea: New Art from Africa and Latin America exhibition at Saatchi Gallery, London (2 April - 31 August 2014). 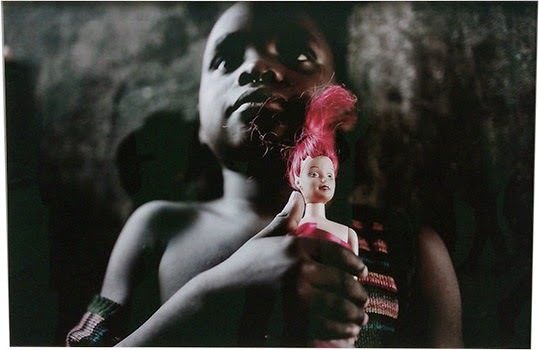 Macilau is a social documentary photographer whose work reflects life in Mozambique. As per the artist statement on his official website, "working with the ghosts of society as the main characters of his photographs is a long story, dating back to the time when he washed cars on the streets of a post-war Maputo." As such, Macilau's practice constructs narratives filled with both beauty and crudeness.